I was trying to take a picture of Target yesterday for the Katz Tales column (the articles I write for The Star, the Malaysian national daily) but our fuzzy has decided that being the star of the picture is dull. First he tried to help press the button. He as fast as Bruce Lee and I didn't do a slow-mo so he's a bit blurred. But you can see by his serious expression that he really is trying to help. When I bought this camera, I forgot that I wanted a built -in lens cover. So I got this pesky thing that dangles by a string. After several attempts to capture Target's handsome profile, I let go of the lens cover. And having that dangling about proved to be another temptation. Here is Target, chewing on it. But I did get one that was half way decent. Here he is, posing nicely on the bed cover. It's not easy to take pics of cats; not even when they're as cute as Target. I mean, look at this effort! Time taken: 35 mins. Picture quality: so-so. Apart from trying to take pics of Target, I have been playing on Facebook. If you are on Facebook, check out my World Literature Quiz and tell me what you think. Should I add more questions? Or is 10 enough already? 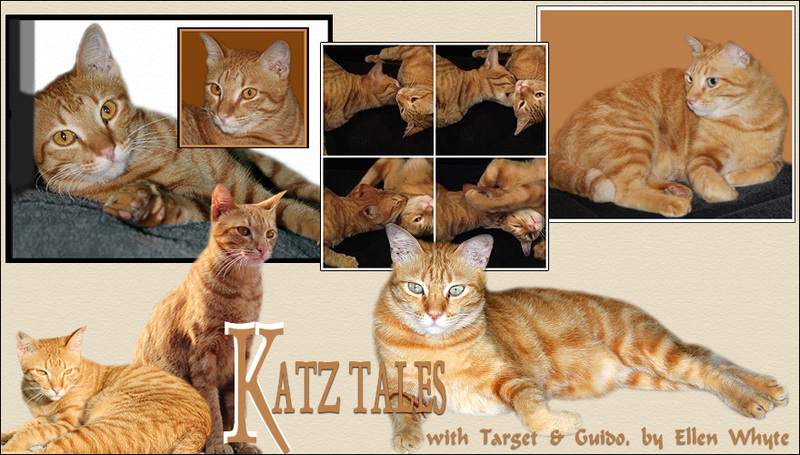 For more Cats on Tuesday visit Gattina or check the list in the left menu bar. That is because cats know that it is worthwhile to keep you from easily getting a good shot. It is more fun to make you work! I use the toy feather (their favourite toy) to get them to look in the direction I want....and it works! Good luck! Lol...I have the same challenge as you when taking cats picture. And mine is blurred most of the time. I am still thinking whether i should invest in a better camera...nah! It will be under utilised. That's so true ! I always take pictures when they think I am not there (but that doesn't last long) as my camera is very small and I switched off the sound, the photo is done before they can move. I also try to never use the flash if I can. Rosie is normal again, but there is still one injection to give. I prefer that to a pill where they struggle and scratch and I am near a nervous breakdown ! Good photos--he's keeping you on your toes I see! Hee hee. I'm back with a post about Anela. Thanks for being patient whilst I took a blogging break. maybe the prefect time to take a pic of them is while they are asleep! still and plenty of times to adjust things. hahha. i take pictures of stray cats and they like target is always moving around the moment i click the camera. Leuk om te weten dat iedereen moeite moet doen om een goeie foto te maken. Ik zou best een andere foto camera willen maar als ik in een winkel sta zie je zoveel ,dan weet ik ook niet welke het beste is, snap je !! He is handsome!!! Shooting moving objets into a picture is so difficult, right? Did you try taking a auto-sequence of photographs? That might be helpful. By the way thank you for giving me another hint for a cocktail. Can't wait for a trial. Ya, animal photography is definately not easy. They dont sit still and dont pose when you ask them to. I normally just sit with them on weekends and snap snap snap. Out of 20 photos, probably there is 1 nice one. I love the second shot best of all. Stolidly munching away on the lens cover. So handsome! And such beautiful hobbit-cat feet. The shot of him seriously trying to help had me going "Awwww". Cats are not easy to photograph at all. They move about too much and they are too smart to sit around waiting for you to point at them with funny black things that could just have ointment/Frontline/shampoo/other unpleasant smelling things in it.